Angela Grassi, MS, RD, LDN was presented with the 2015 Ricardo Azziz PCOS Challenge Advocacy Leadership Award at the third annual Southern Regional PCOS Awareness Symposium in Atlanta, Georgia. The award recognizes individuals who have demonstrated extraordinary dedication to advocacy and public policy efforts that expand access to resources and support for women and girls with Polycystic Ovary Syndrome (PCOS), one of the most neglected, underfunded and underdiagnosed areas of women’s health. Angela Grassi is Founder of the PCOS Nutrition Center, a company at the forefront of providing evidence-based nutrition information and counseling to women with PCOS. Angela is the author of several books on PCOS including PCOS: The Dietitian’s Guide, The PCOS Workbook: Your Guide to Complete Physical and Emotional Health, The PCOS Nutrition Center Cookbook and is the author of the section on PCOS in The Academy of Nutrition and Dietetics Nutrition Care Manual. Additionally, Angela serves as the PCOS expert for About.com. Angela was recognized by Today’s Dietitian as one of the Top 10 Incredible Dietitian’s Making a Difference in 2014. She is also a past recipient of the Award in Excellence in Practice in Women’s Health and The Award for Excellence in Graduate Research from the Academy of Nutrition and Dietetics. Angela is also being recognized this year by the Academy of Nutrition and Dietetics as the 2015 Outstanding Nutrition Entrepreneur. PCOS Challenge named the advocacy leadership award in honor of Dr. Ricardo Azziz, an international authority on Polycystic Ovary Syndrome and one of the country’s most impactful advocates for the PCOS patient community. For the past 25 years, Dr. Azziz has developed an internationally recognized research program which has been continuously funded by the National Institutes of Health, generated over 500 peer-reviewed articles, book chapters and reviews; over 300 abstracts and presentations at national meetings; and nine texts. Dr. Azziz has made major contributions to the field through his research and clinical work as well as his support and advocacy for PCOS patients. Dr. Azziz has been instrumental in enabling events like PCOS Challenge’s Awareness Symposia to happen across the country educating over 1,000 PCOS patients and healthcare professionals. PCOS Challenge recognizes the significance of Dr. Azziz’s contributions to the PCOS movement with this award. 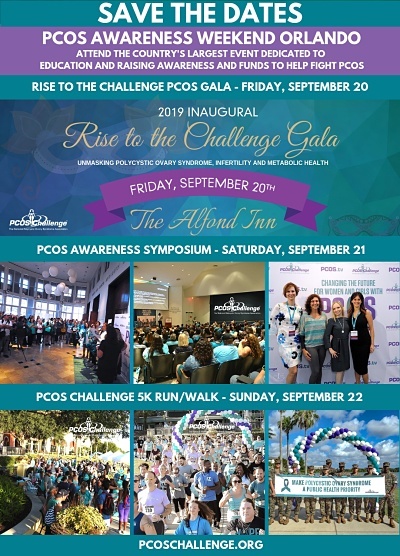 PCOS Challenge, Inc. is the largest and most active 501(c)(3) nonprofit support organization advancing the cause for women with Polycystic Ovary Syndrome, serving over 31,000 members. The organization touches the lives of women with PCOS and their supporters each year through television and radio programming, online and offline support groups, and education and awareness initiatives. Since PCOS Challenge began its programs in 2009, the organization has helped many women find answers that have helped them overcome their struggles with infertility, weight gain, anxiety and depression and reduce their risk for numerous life-threatening related conditions including type 2 diabetes, cardiovascular disease and cancer.